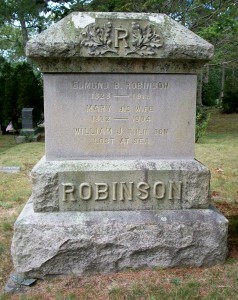 Died: December 23, 1904 in Bourne Ma. at 72 yrs. Married: March 30, 1855 in Boston Ma. 1. 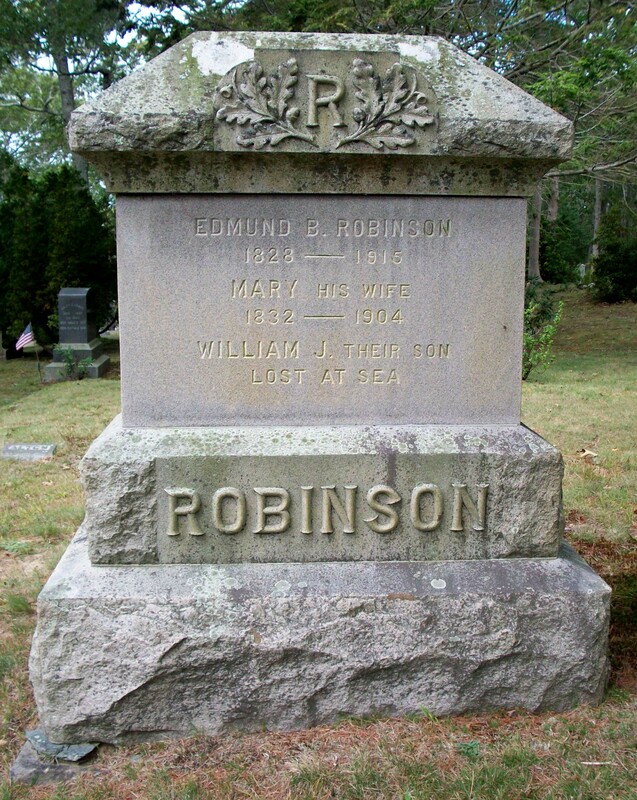 William J. Robinson; (Abt.1855 – August 24, 1873); William died at 18 yrs, 1 mo, 5 d.; He was a mariner & was unmarried; “Lost at sea from the fishing schooner Lizzie D. Barker near Cape Cod, gale of wind”; His name is on his parents’ headstone in Cataumet Cemetery. 2. Eddie Gould Robinson; (April 4, 1864 – ? ); No further information; (Eddie & Edmund, Jr. could be the same person). 3. Edmund Buxton Robinson, Jr.; (April 1864 – March 9, 1955); Married Emma J. (Dunphy) Wright (1880 – 1964) (James Dunphy & Catherine M. Sullivan) in Bourne Ma. on February 25, 1911; Emma married (1) Frederick Alton Wright (1871 – 1906) (Augustus Weston Wright & Anfinet/Nellie Walton Gibbs); Frederick married (1) Edith Evelyn Jones (1873 – 1900) (Stephen M. Jones & Adeline A. Hoxie) in Bourne Ma. on August 19, 1899; Edmund & Emma are buried in Cataumet Cemetery. 4. George Wiley Robinson; (February 4, 1870 – January 28, 1947); Married Sarah Margaret Daunt (1875 – 1956) (Benjamin Daunt & Margaret O’Neil) in North Falmouth Ma. on August 16, 1897; Sarah married (2) Merton Edwin Long (1885 – 1977) (Herbert Augustus Long & Ella Jane Thompson) on December 15, 1948; Merton married (1) Blanche Louise Weeks (1881 – 1947) (Henry William Weeks & Sarah Howe Wing) in Bourne Ma. on December 23, 1908 & married (3) Dorothy May (Alden) Barnes Townsend (1896 – 1991) (William Herbert Alden & Amanda Coombs) in Bourne Ma. on September 4, 1957; Dorothy married (1) George Linwood Barnes (1891 – 1967) (Andrew Willis Barnes & Eliza A. McKenney) in Portland Me. on June 24, 1916 & married (2) (–) Townsend; George & Sarah are buried in Cataumet Cemetery.